and how it can help you in your clinical work. 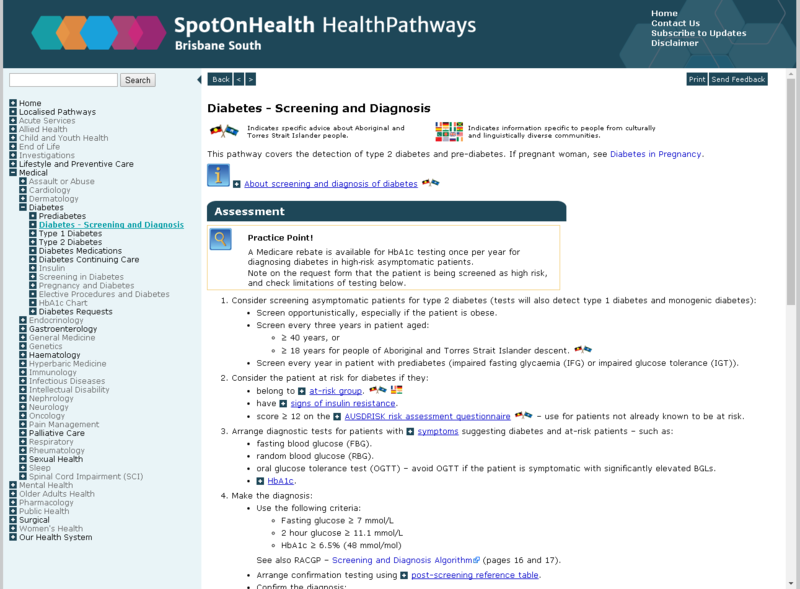 SpotOnHealth HealthPathways provides clinicians in the greater Brisbane South catchment with web-based information outlining the assessment, management and referral of more than 550 conditions. Click on the image to the right to see an example pathway. HealthPathways is based on an initiative from the Canterbury District Health Board (CDHB) in Christchurch, New Zealand, where it has contributed to significant improvements in the way hospitals and general practice share the care and management of patients. It is designed to be used at point of care primarily by general practitioners but is also available to specialists, nurses, allied health and other health professionals. Please click on the image above to see a pathway. The HealthPathways portal is not designed for patient use, therefore a username and password is only provided to clinicians. However, many of the pathways do contain information for patients which can be printed off and given to patients at the time of consultation. 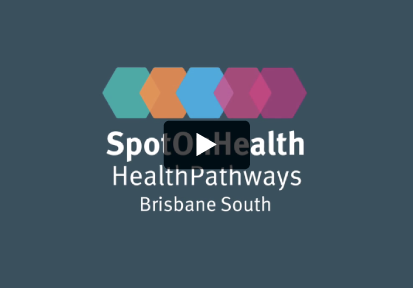 SpotOnHealth HealthPathways is being progressively localised to the Brisbane South region through collaborations between general practitioners, hospital specialists, allied health and nursing providers, non-government organisations and peak bodies. Localised pathways can be found in the Table of Contents under ‘Localised Pathways'. We anticipate that the process of localising all the pathways to the Brisbane South region will take a period of up to five years. New Zealand pathways may contain useful condition management information. However, please use your clinical judgement as to the appropriateness for your patient and the Brisbane South region. Please keep this in mind whilst viewing the site. Find out more about how pathways are developed here. Request a pathway to be localised or developed. An initiative of Metro South Health and Brisbane South PHN in partnership with Mater Health Services and Children’s Health Queensland, SpotOnHealth HealthPathways is only possible with the support of our regional, state, private and non-government health care partners. Find out more about our partners here.